Description : The direct precursor to the Hyperblaster. 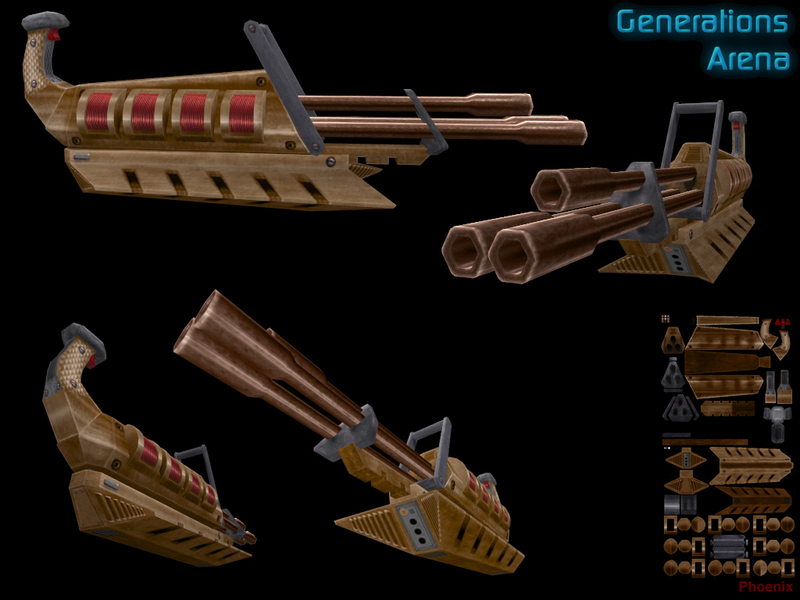 This fast-firing triple-barreled energy gun spits out blaster bolts fast and eats your cells even faster. It's more damaging than the Strogg Troopers' quad-barreled descendent, but it's not as stable and lacks the armor penetrating properties as well. It does dish out damage faster than the Super Nailgun, has a longer range than the Thunderbolt, and the ricochet can hit targets around corners or missed by the first pass. Just be sure you don't zap yourself with them! Shares cells with the Thunderbolt and Mjolnir. Damage: 18, less with ricochet. Super Bolt Damage: 25, less with ricochet. Special Features: Shots can ricochet up to 2 times. Bottom barrels fire 2 lasers per shot. Top barrel occasionally fires a "super" bolt that does additional damage.